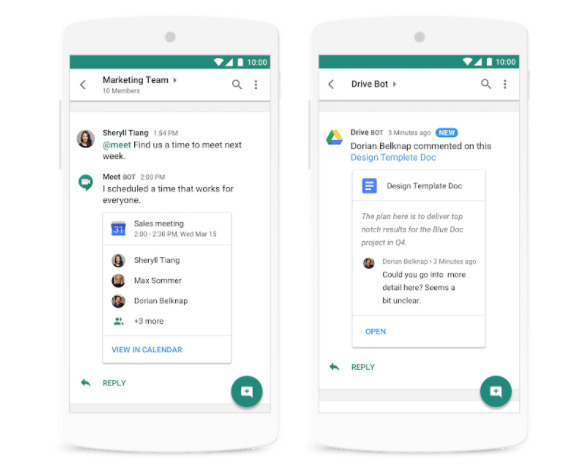 Google is increasing its efforts to make its productivity tools indispensable by taking on Slack, announcing its Hangouts Chat app for collaborations between team members will be rolling out to business customers of its G Suite service starting from next week. Quietly introduced last year in an early adopter program, Google has confirmed it is making Hangouts Chat a core G Suite service starting from today, with the new addition arriving in G Suite accounts in the near future. Users of G Suite accounts will not receive immediate access to the new tool, and will have to wait for the account holder to enable it for them. While it shares the same name as Google's existing Hangouts messaging service, Hangouts Chat is a separate application that is designed more to help teams work together than for casual conversations. 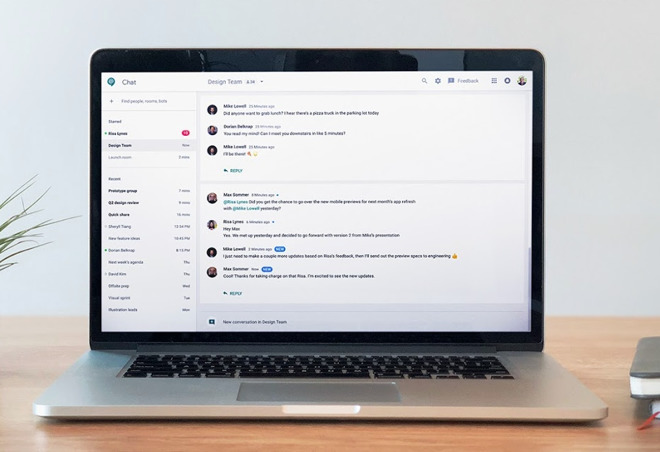 Similar in concept to Slack, Hangouts Chat lets employees in a business talk to each other, or to a specific team, with conversations able to be split off into separate chat rooms dedicated to specific tasks or subjects. Team members can collaborate through Hangouts Chat with each other while working collectively in the other tools offered in G Suite, including Docs, Sheets, and Slides. Everything in Hangouts Chat is searchable, including team members, conversations, and files shared between employees. Google also touts the use of artificial intelligence and chat bots to help speed up workflows. A total of 25 different chat bots are included to cover tasks ranging from finance and human resources to CRM and project management, with the bots claimed to simplify tasks, such as booking conference rooms or searching for file, that could take far longer if performed by humans. Like Slack, Google is allowing its users to build integrations on top of Hangouts Chat, and already has a small library of chat bots developed by third parties for use with the tool. The list includes a number of major enterprise-focused firms, including Freshdesk, Trello, Salesforce, ProsperWorks, Vonage, and Xero. Google intends for Hangouts Chat to be used by as many users as possible, with each instance capable of supporting up to 8,000 members. Apps for MacOS and iOS, as well as Windows and Android, are being provided by Google, effectively making the tool available on most platforms used by businesses. Though separate to Hangouts, Google notes Hangouts Chat will still work with its existing communications service, including all of the user's existing contacts. It remains to be seen if Hangouts Chat will gain traction in an industry dominated by Slack along with attempts to occupy the collaborative chat marketplace by Facebook and others. While Google is seemingly late to the party, the inclusion of Hangouts Chat may cause existing G Suite customers to dump the paid Slack service in favor of a "free" addition to a subscription they already have.